This Holy Week, which will culminate tomorrow morning in the celebration of Easter, enables us to live days of intensity. Having come here from so many different countries, we experience a communion beyond the borders of languages and denominations. It is he, the Risen Lord, who brings us together. Although he remains invisible to our eyes, he can be mysteriously present for every human being, for each one of us. On the cross Jesus suffered terribly and died like a criminal. But in the depths of this suffering we discern a reality which is deeper still. We see it appear on the icon of the Cross: Jesus opens his arms to welcome every human being into his love. Even with our faults and our inner violence, we are welcomed by him. In this way the suffering and death of Jesus transforms our suffering and our death. The tragedy is not eliminated; we remain disoriented in the face of evil. But as for Jesus, deeper than the evil, a light of hope shines, even if we scarcely realize it. The flame may flicker, but it will not go out. To feed this flame of hope we need each other. We brothers would like to do all we can for you to discover this hope in your lives. 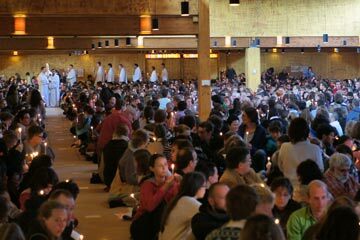 And, conversely, your presence here in Taizé nourishes our hope. Yes, it is Jesus Christ who unites us. And he wants to make us passionate seekers of communion, creators of friendship among believers and non-believers. Brother Roger inscribed this passion for communion in the vocation of our community. And you know that next year we are going to remember him in several celebrations, especially on August 16, ten years after the day he was killed here in this church. It is because of this passion for communion that we do not all live here in Taizé, but some brothers live in small groups on different continents, and others travel to visit different countries, to listen to what others are going through. And so, two brothers went to Ukraine a month ago. So many young people from that country come here and to the European meetings. We could not only observe from afar what they are going through. Another brother will leave for Russia on Monday to celebrate Easter week with the Christians of that country. In the serious conflict that is taking place at this time, in both countries there are women and men who want peace. The same passion for communion leads us to seek ways of heading towards visible unity among Christians. And it seems that the current time is right to take further steps in this direction. The flame of hope that Christ kindles in each of us unites all the baptized. Making that unity more visible is the condition for the fire of Christ’s love to shine out for all who seek hope. So I would ask you to pray for those who have a ministry in the various churches: Protestant, Orthodox, or Catholic: whether they are close to you or whether they have wider responsibilities. They have a very difficult task really to be “good shepherds” as Jesus asked. At Taizé we are extremely grateful for the confidence that we find among the leaders of the various Churches. I could feel this when I took part last year in the General Assembly of the World Council of Churches. It was held in South Korea, at Busan, and brought together many Protestant and Orthodox Church leaders. On that occasion, I had the opportunity to visit North Korea. The meetings I was able to have with different people there remain etched in my memory. And these days we remember in our prayers the victims, including many children, of the recent shipwreck in South Korea. Last year too, we spent Epiphany with a hundred young people in Istanbul. What a beautiful welcome we received from Patriarch Bartholomew of Constantinople! And I want to say a word about Pope Francis. He received me at the end of November and we spoke together. What goodness radiates from him, what comprehension for our community! He strongly encouraged me to continue to welcome young people to Taizé, and to continue our life as an ecumenical community. I was able to greet him again three weeks ago during the Eucharist he celebrates every morning in his small chapel. And that same day, in the evening, Benedict XVI welcomed me in the monastery at the Vatican where he retired. I thanked him for the hospitality he showed to us during our European meeting in Rome and for the unforgettable prayer in St. Peter’s Square on December 29, 2012. I would also like you to remember in your prayers the next stages of the pilgrimage of trust. Brothers are currently in Texas for a pilgrimage involving three meetings in Austin, Dallas and Houston. For my part I will leave at the end of next week for Mexico. For months now several brothers have been preparing a young adult meeting in Mexico City. When you return home, you will also continue the pilgrimage of trust in your daily life. Let us all be confident that the Risen Christ goes before us on our way, that he welcomes us and remains alongside us wherever we go.